Frederick William I (German: Friedrich Wilhelm I) (14 August 1688 – 31 May 1740), known as the "Soldier King" (German: Soldatenkönig), was the King in Prussia and Elector of Brandenburg from 1713 until his death in 1740, as well as Prince of Neuchâtel. He was succeeded by his son, Frederick the Great. He was born in Berlin to Frederick I of Prussia and Sophia Charlotte of Hanover. During his first years, he was raised by the Huguenot governess Marthe de Roucoulle. His father had successfully acquired the title King for the margraves of Brandenburg. On ascending the throne in 1713 the new King sold most of his fathers' horses, jewels and furniture; he did not intend to treat the treasury as his personal source of revenue the way Frederick I and many of the other German Princes had. Throughout his reign, Frederick William was characterized by his frugal, austere and militaristic lifestyle, as well as his devout Calvinist faith. He practiced rigid management of the treasury, never started a war, and led a simple and austere lifestyle, in contrast to the lavish court his father had presided over. At his death, Prussia had a sound exchequer and a full treasury, in contrast to the other German states. 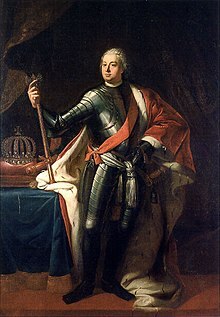 Frederick William I did much to improve Prussia economically and militarily. He replaced mandatory military service among the middle class with an annual tax, and he established schools and hospitals. The king encouraged farming, reclaimed marshes, stored grain in good times and sold it in bad times. He dictated the manual of Regulations for State Officials, containing 35 chapters and 297 paragraphs in which every public servant in Prussia could find his duties precisely set out: a minister or councillor failing to attend a committee meeting, for example, would lose six months' pay; if he absented himself a second time, he would be discharged from the royal service. In short, Frederick William I concerned himself with every aspect of his relatively small country, ruling an absolute monarchy with great energy and skill. In 1732, the king invited the Salzburg Protestants to settle in East Prussia, which had been depopulated by plague in 1709. Under the terms of the Peace of Augsburg, the Prince-Archbishop of Salzburg could require his subjects to practice the Catholic faith, but Protestants had the right to emigrate to a Protestant state. Prussian commissioners accompanied 20,000 Protestants to their new homes on the other side of Germany. Frederick William I personally welcomed the first group of migrants and sang Protestant hymns with them. Although a highly effective ruler, Frederick William had a perpetually short temper which sometimes drove him to physically attack servants (or even his own children) with a cane at the slightest provocation. His violent, harsh nature was further exacerbated by his inherited porphyritic disease, which gave him gout, obesity and frequent crippling stomach pains. He also had a notable contempt for France, and would sometimes fly into a rage at the mere mention of that country, although this did not stop him from encouraging the immigration of French Huguenot refugees to Prussia. Frederick William died in 1740 at age 51 and was interred at the Garrison Church in Potsdam. During World War II, in order to protect it from advancing allied forces, Hitler ordered the king's coffin, as well as those of Frederick the Great and Paul von Hindenburg, into hiding, first to Berlin and later to a salt mine outside of Bernterode. The coffins were later discovered by occupying American Forces, who re-interred the bodies in St. Elisabeth's Church in Marburg in 1946. In 1953 the coffin was moved to Burg Hohenzollern, where it remained until 1991, when it was finally laid to rest on the steps of the altar in the Kaiser Friedrich Mausoleum in the Church of Peace on the palace grounds of Sanssouci. The original black marble sarcophagus collapsed at Burg Hohenzollern—the current one is a copper copy. His eldest surviving son was Frederick II (Fritz), born in 1712. Frederick William wanted him to become a fine soldier. As a small child, Fritz was awakened each morning by the firing of a cannon. At the age of 6, he was given his own regiment of children  to drill as cadets, and a year later, he was given a miniature arsenal. The love and affection Frederick William had for his heir initially was soon destroyed due to their increasingly different personalities. Frederick William ordered Fritz to undergo a minimal education, live a simple Protestant lifestyle, and focus on the Army and statesmanship as he had. However, the intellectual Fritz was more interested in music, books and French culture, which were forbidden by his father as decadent and unmanly. 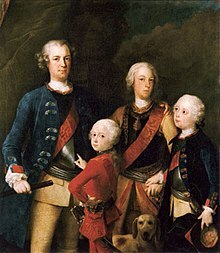 As Fritz's defiance for his father's rules increased, Frederick William would frequently beat or humiliate Fritz (he preferred his younger sibling Augustus William). Fritz was beaten for being thrown off a bolting horse and wearing gloves in cold weather. After the prince attempted to flee to England with his tutor, Hans Hermann von Katte, the enraged King had Katte beheaded before the eyes of the prince, who himself was court-martialled. The court declared itself not competent in this case. Whether it was the king's intention to have his son executed as well (as Voltaire claims) is not clear. However, the Holy Roman Emperor Charles VI intervened, claiming that a prince could only be tried by the Imperial Diet of the Holy Roman Empire itself. Frederick was imprisoned in the Fortress of Küstrin from 2 September to 19 November 1731 and exiled from court until February 1732, during which time he was rigorously schooled in matters of state. After achieving a measure of reconciliation, Frederick William had his son married to Princess Elizabeth of Brunswick-Wolfenbüttel, whom Frederick despised, but then grudgingly allowed him to indulge in his musical and literary interests again. By the time of Frederick William's death in 1740, he and Frederick were on at least reasonable terms with each other. Although the relationship between Frederick William and Frederick was clearly hostile, Frederick himself later wrote that his father "penetrated and understood great objectives, and knew the best interests of his country better than any minister or general." He was the godfather of the Prussian envoy Friedrich Wilhelm von Thulemeyer and of his grand-nephew, Prince Edward Augustus of Great Britain. ^ Taylor, Ronald (1997). Berlin and Its Culture: A Historical Portrait. New Haven, Conn.: Yale University Press. p. 51. ^ Walker, Mack (1992). The Salzburg Transaction: Expulsion and Redemption in Eighteenth-Century Germany. Ithaca, New York: Cornell University Press. ISBN 0-8014-2777-0. ^ MacDonogh, Giles (2007). After the Reich: The Brutal History of the Allied Occupation. New York: Basic Books. p. 93. ^ Farquhar, Michael (2001). A Treasure of Royal Scandals. New York: Penguin Books. p. 114. ISBN 0-7394-2025-9. Wikimedia Commons has media related to Frederick William I of Prussia.